I created the game “Un Minuto Loco” back in 2012 as an engaging way to help my high school students learn verb conjugations. Students race to conjugate as many verbs they can within the time limit, similar to mad minute math drills. Verb drills aren't necessarily anything new, but there's something special about how the Minuto Loco format resonates with secondary students. In this post I address how to play the game, why it works, and how I recommend fitting it in your classroom, especially as we aim to make our classrooms more proficiency and input driven. Minuto Loco races can be adapted for a variety of content - verbs, vocabulary, etc. For the most part, I use them to reinforce and practice the verbs and verb tenses we are learning at any given point in class. Learning Objective: Students will be able to conjugate the given Spanish verbs in the given tense. Each student keeps their Minuto Loco sheet turned face down until the race begins. Teacher sets the timer for 1 - 3 minutes, depending on your students' level. Teachers says "go" and students write as many conjugations for the given verbs as possible in the time allotted. 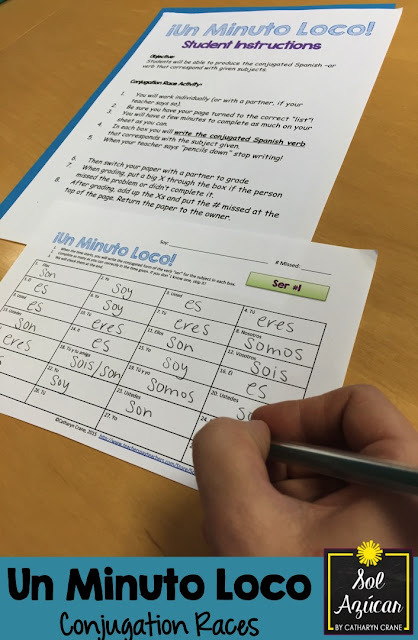 In each box on the Minuto Loco sheet, students write the conjugated Spanish verb that corresponds with the subject given. Teacher calls "pencils down" when time expires and students stop writing. To grade, students switch papers with a partner. Teacher posts the answers and students place a big X through the box for all problems that are incorrect or incomplete. After grading, they add up the Xs and put the number missed (or number correct) at the top of the page, returning the Minuto Loco race sheet to the original owner. For my students, we take about 10 minutes to complete one round, grade their answers, and award prizes. Teacher starts the stopwatch at 0, running it forward. Teachers says "go" and students write conjugations for the given verbs, raising their hand when all problems are complete. The teacher writes down the time for each student as they finish. Students aim to reduce their time over successive practices. But isn't drill and kill bad for students? The pendulum is in Foreign Language pedagogy is swinging away from drill and kill to more contextualized language learning, right?! So games like this would be pointless, correct? While I VERY much believe that language learning should be applied, contextualized, and relevant, I also believe that older language learners (beginning in the teen years) DO benefit from some simple memorization. 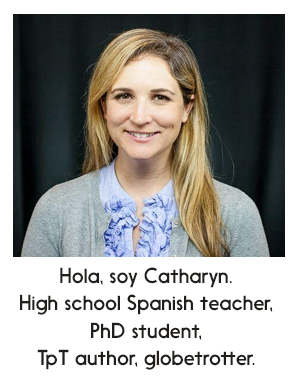 Take a personal example... Back when I was in high school, as a native English speaker, I spent many useful hours memorizing SAT vocabulary words which I still use TODAY! Sure, I learned some of those words through authentic experiences reading books, listening to TV, and my parents. But the drill and kill method also was helpful in the end. Years of cognitive science research has shown again and again that repeated exposure can be an effective way to encode new content in your brain. This is especially true when it comes to simple language, like new vocabulary words and verb structures. Should you drill and kill with conjugation games non-stop? NO! Consider using activities like this as a simple warm up or closure activity. From my own experience, games like this are a great way to engage students and motivate them to learn. But are timed tests bad for students? There is some evidence that timed tests in this format can cause anxiety for students. Specifically, in her work with timed math tests in elementary school, Jo Boaler has shown that about a quarter of the students in the elementary classrooms she studied experienced numerous negative outcomes with timed math tests. Kids described feeling nervous, worried, pressured, and afraid to make mistakes. These feelings were related to poor performance on the tests. Nonetheless, the other three quarters of students that she studied tended to do well with a timed format. It is also a very efficient way for large classes to consistently practice relatively rote skills together. From my own experience doing these games with classes of 35+ at my large title one school, I didn't get the perception that any of my high school students felt overwhelmingly anxious or defeated by this timed activity format. That said, making my students feel safe and confident in class is a top priority for me. So here are a few suggestions for how to help make sure the Minuto Loco activity is not anxiety provoking. I never ever count Minuto Loco scores for a grade. I never ever post scores publicly. Any progress monitoring is done by individual students. I don't begin a Minuto Loco until we've spent multiple class days exploring the given topic. I want my students to feel confident going into the conjugation race. Minuto Loco races are easy enough to create yourself. Just insert a table into a word document, and type in the verbs you want students to conjugate. Print 'em out and you're ready to play. Or for a few bucks, pick up my Minuto Loco races in my Teachers Pay Teachers store. 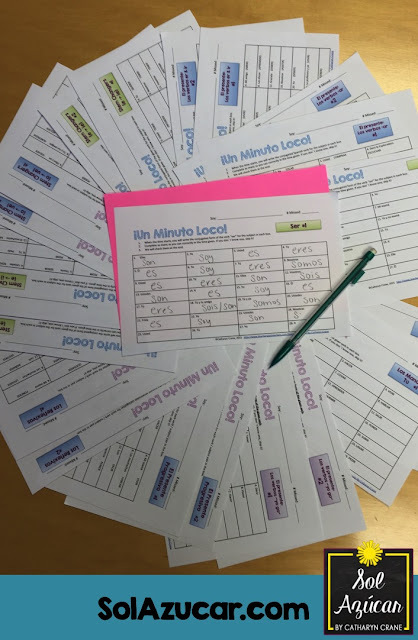 I have a big list, my Minuto Loco Menu, where I list every race I currently have for sale, if that's helpful, and check out my Minuto Loco ER & IR Verbs in Present Tense as a free sample! I hope this info was helpful and that you might consider giving this activity a try with your classes. hola!! me encanta la idea!! podria tener el documento para imprimirlo para mis alumnos?